This FUSE review was made after playing the game about 10 times. FUSE is a real-time cooperative board game in which you are trying to defuse a certain amount of bombs before they blow up your ship. You and your teammates only have 10 minutes to defuse all of the bombs, so you have to be composed and quick as you work through each one. FUSE was created by Kane Klenko (Dead Men Tell No Tales) and is published by Renegade Game Studios. The FUSE game rules are quite simple to understand, so it can be taught in 15 minutes or less in most cases. 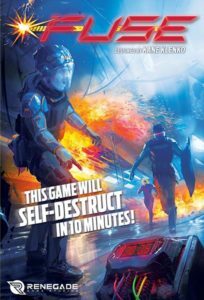 You will be looking at just three things during the entire game: the bomb cards, the dice, and the Ship’s Computer (timer) on your mobile device. You will only be looking at the cards and the dice for the most part, but you will check the timer every once in a while. So, how do you play FUSE? Well, basically you’re trying to defuse the bombs by placing your dice on the matching icons on your cards. In the normal game, the cards range in difficulty from 1-4, with 1 being the easiest. Sometimes the cards will require you to simply match a color, while some of the most difficult cards will have you stack specific dice on top of each other. When it’s your turn, you will draw dice equal to the number of players in the game. Each player can take one die to help them solve one of the two bomb cards in front of them. This is where cooperation comes into play. You have to decide who needs which dice so you can move through the cards quickly. If you’re able to get through all of the cards before the time runs out, you win! If you don’t… well, then you don’t win. The FUSE app allows you to save all of your scores, so you and your team can try to beat your high scores on each difficulty level. No alpha players allowed! It is pretty much impossible for someone to take over and tell everyone what to do in this game. Those who avoid cooperative board games because of alpha gamers will probably love FUSE. Another great thing about FUSE is that you will always know how long it will last. No matter what you do, you can be sure that the countdown will end after 10 minutes. Most gamers will appreciate the quick play time since it will allow them to plan out any other games they want to play on board game nights. The FUSE app definitely gives the game some atmosphere, so most people will be able to get into the theme of this game. Sure, you’ll mostly be thinking about the dice and cards, but it’s hard not to feel like you are frantically defusing bombs. You can very easily teach this game to people in about five minutes. It has very simple rules that even non-gamers should understand every quickly. FUSE can be exhausting. It’s only a 10 minute game, but you are frantically moving (and sometimes balancing) dice for that entire 10 minutes. You won’t be too drained after the first game, but just wait until you’ve gone through your third and fourth games. Most people will be okay with it being a bit tiring, but, understandably, some don’t want that from their board games. You can get pretty unlucky with the bomb cards that you draw. The deck is completely randomized, so you could end up with a bunch of very difficult bombs to deal with. Some people will like that type of random challenge, but it can be frustrating in-game when you draw tough bombs after just dealing with a bunch of other tough bombs. I’m personally not a huge fan of real-time games, but I share my group’s opinion that FUSE is a solid cooperative game. In fact, it’s one of our top 5 real-time board games right now. I would call FUSE an amazing game, but it is one that most people would be happy to own since it is an inexpensive filler and it requires a lot of teamwork to beat. It’s also quite challenging, so it will take a long time to master. If the bomb-defusing theme sounds cool to you and you like real-time games, definitely check out FUSE. It’s arguably one the best real-time cooperative games around and we’re looking forward to playing the sequel, Flatline: A FUSE Aftershock Game. Thanks for taking the time to read our FUSE review!